The Democratic Republic of Congo's presidential elections appear to be heading for a run-off, with the latest results from Kinshasa showing the incumbent president's lead dwindling. The Kinshasa vote counts, which have started to be published heavily favor former rebel boss Jean-Pierre Bemba and, analysts say, will probably reduce President Joseph Kabilas lead enough to require a second round run-off. Just under three weeks after millions of Congolese took part in their country's historic elections, results for voting in the capital are finally beginning to be published. Until now, figures had trickled in from the 50,000 polling stations across the vast African nation, but little was known about how the volatile capital, which is home to some eight million people, had voted. This fueled speculation that incumbent President Joseph Kabila's strong showing in his native east would give him over 50 percent of the vote and, therefore, a first round victory. But results from the capital, where Lingala is the local language and many are hostile to the Swahili-speaking president from the country's east, have brought his total just below the 50 percent mark. As of Thursday, Mr. Kabila had just over 48 percent of the votes counted, well ahead of Bemba's 16 percent, but not enough to avoid a run-off. Diplomats and analysts say that, with more votes to come in from Kinshasa, there is little chance of a first round victory for Mr. Kabila, and a second round of elections, due by the end of October, seems inevitable. Some diplomats say this will help ease mounting tensions in a capital that is likely to have reacted angrily to a Kabila victory in the first round. But it also paves the way for a potentially hostile duel between the president and the former rebel. In a sign of what some fear may be to come, Congo's media authority suspended three television stations Thursday for allegedly trying to incite violence between civilians and the security services. 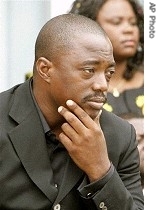 Two of the stations back Mr. Kabila while the other is close to Bemba. Congo's July 30 presidential polls were meant to give the former Belgian colony a fresh start after a decade of war and chaos, during which over four million civilians have died.